OCTOBER 11, 2:18pm: Wainwright’s contract includes incentives based on both starting and relieving, Derrick Goold of the St. Louis Post-Dispatch reports (on Twitter). The contract’s base salary remains unknown. 12:24pm: The Cardinals announced Thursday that they’ve re-signed right-hander Adam Wainwright to a one-year contract for the 2019 season. 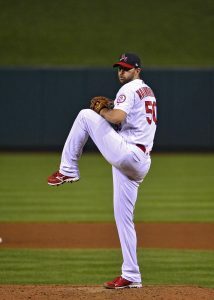 Wainwright, who recently turned 37, had been slated to hit free agency. He’s a client of Aegis Sports Management. The 2019 season will mark the 15th Major League season of Wainwright’s illustrious career — each of which has come as a member of the Cardinals. A two-time NL Cy Young runner up and four-time top-three finisher in that voting, Wainwright has now tied righty Bob Forsch for the third-most seasons as a Cardinals pitcher in team history. This past season was an injury-plagued campaign for Wainwright, who pitched just 15 1/3 innings in April before hitting the disabled list due to elbow inflammation. He returned after a few weeks only to land on the disabled list after just 2 1/3 innings. That second DL stint, which was also initially due to elbow inflammation lasted nearly four months. Once healthy enough to return to the mound, Wainwright reeled off 17 shutout innings on a minor league rehab assignment and returned to the Cards to make four starts in September. He was tagged for four runs in three of those four starts and turned in an unsightly 4.84 ERA in 22 1/3 innings, but he also notched an impressive 25-to-4 K/BB ratio in that time and saw his fastball jump back up to the same levels at which it sat in 2016-17. The question for St. Louis now is one of just how Wainwright will factor into the 2019 staff. The Cards weren’t lacking rotation options even without Wainwright, with Carlos Martinez, Jack Flaherty, Miles Mikolas, Michael Wacha, Alex Reyes (if healthy), Luke Weaver, Dakota Hudson, John Gant, Daniel Poncedeleon and Austin Gomber all on the roster. It’s not clear that he’ll be promised a rotation spot at this point, but perhaps a return to the bullpen shouldn’t be entirely discounted. The Cardinals’ relief corps was somewhat jumbled late in the season after a massive overhaul prior to the non-waiver trade deadline in which Greg Holland, Sam Tuivailala and Tyler Lyons were all sent packing. Bud Norris, who spent much of the season closing in St. Louis before ceding that role to Martinez in the latter’s return from the disabled list, is a free agent and isn’t any sort of lock to return. August addition Tyson Ross is bound for the open market, too. Meanwhile, 2017-18 offseason pickups Luke Gregerson (two-year, $11MM free-agent deal) and Dominic Leone (acquired from the Blue Jays for Randal Grichuk) combined for just 36 2/3 innings due to injury. The 2018 season wasn’t all bad for the Cards in terms of bullpen developments, though. Flamethrowing young righty Jordan Hicks arrived on the scene and established himself as a potential long-term piece, while righty John Brebbia somewhat quietly turned in an excellent sophomore season. Wainwright could certainly be penciled in to join that pair, along with some of the rotation candidates who don’t ultimately secure starting jobs, though perhaps the team will simply wait until Spring Training to see how the staff comes together. The Cards, after all, figure to have a busy offseason ahead of them as they look to rework a flawed roster, and it’s possible that some of those younger pitching options could land elsewhere via the trade market. Regardless of his role, Wainwright will return to serve as a leader on a staff of considerably younger arms, and his new contract will give him one more year with Yadier Molina — one of the most iconic pairings in franchise history. There’s been plenty of speculation about whether Adam Wainwright was playing out his final season as a big leaguer, but Derrick Goold of the St. Louis Post-Dispatch reports that Wainwright does want to continue pitching and has already been in touch with the Cardinals about a possible return. GM Mike Girsch seemingly confirmed as much, telling Goold that the two sides have had “general conversations” about a 2019 return. The 37-year-old Wainwright’s future was in doubt for much of the year, as he pitched just 15 1/3 innings in April before hitting the disabled list due to elbow inflammation. Wainwright returned after a few weeks only to return to the disabled list (once again, due to elbow discomfort) after just 2 1/3 innings. That second DL stint lasted nearly four months. Wainwright, however, rattled off 17 scoreless innings on a minor league rehab assignment and returned to the St. Louis rotation in September, making four starts down the stretch. He allowed four runs in three of those four outings and pitched to an overall 4.84 ERA in 22 1/3 innings, but he also turned in a dominant 25-to-4 K/BB ratio. Fielding-independent metrics pegged him for a true ERA more in the low-3.00s, and his average fastball sat at an even 90.0 mph — nearly identical to his career 90.4 mph average. Wainwright won’t turn 38 until Aug. 30 of next year, and it seems that he still has fuel left in the tank on what has been a terrific career to date. Exactly how he’d fit into the pitching staff, however, remains to be seen. The Cards project to have Carlos Martinez, Miles Mikolas, Jack Flaherty, Michael Wacha and, if healthy, Alex Reyes in next year’s rotation. If Reyes’ injury troubles persist or if he’s moved to a bullpen role, the St. Louis organization has numerous internal alternatives in Luke Weaver, Dakota Hudson, John Gant, Austin Gomber and Daniel Poncedeleon, among others. Certainly, it’s a deep core of starting pitching options and one that seems unlikely to maintain wholly intact as pitching-hungry teams offer up MLB-ready bats to the Cardinals on the offseason trade market. Reinserting Wainwright into that mix would only deepen the staff and further make trades easier to stomach for Girsch and president of baseball ops John Mozeliak, though the financials of a Wainwright return still need to be hammered out. It’s clear that Wainwright won’t command a salary along the lines of the $19.5MM annual rate that came with his previous five-year, $97.5MM deal, but the Cards would still likely need to make a reasonable guarantee, likely with the opportunity for additional earnings via incentives. Speculatively speaking, even if the organization were to decide that there’s no room for Wainwright in the rotation, it’d be interesting to see if he’d be amenable to returning as a reliever. Wainwright, after all, cemented himself in Cardinals lore by closing out the NLCS and the World Series as an exuberant 25-year-old rookie back in 2006. The Cardinals’ closer role is currently up in the air, and a return to that job for Wainwright would represent something of a full-circle journey. The Cardinals already have more than $110MM on the books for 2019, and that’s before arbitration raises for Wacha, Marcell Ozuna, Dominic Leone, and Chasen Shreve. It’d be a surprise, though, if St. Louis didn’t try to shed some payroll by moving some veterans whose performance makes it clear that they no longer fit with the roster. Dexter Fowler’s remaining $49.5MM over the next three seasons will be near impossible to move without absorbing a significant portion of that deal, but he no longer looks to be a par of the long-term outlook in the outfield. Relievers Brett Cecil and Luke Gregerson are on less onerous contracts and could potentially be moved in salary-motivated trades, as well. Mozeliak, Girsch and the rest of the front office figure to be in for an active offseason, with the Wainwright decision presumably serving as the first of many. 7:28pm: St. Louis GM Mike Girsch says that Wacha will not return this season, as MLB.com’s Jen Langosch tweets. Wacha’s oblique injury was aggravated, removing any chance of his return. 1:54pm: The Cardinals announced Monday that they’ve activated right-hander Adam Wainwright from the 60-day disabled list and transferred righty Michael Wacha from the 10-day DL to the 60-day DL in order to create space on the roster. The 37-year-old Wainwright will start tonight’s game against the Pirates, marking his first appearance since May 13. The three-time All-Star and two-time Cy Young runner-up has been bothered by elbow issues for much of the season after initially landing on the DL for inflammation back in May. He’s been limited to four appearances in 2018, totaling just 18 innings of work for the Cards in that time. Wainwright told reporters back in Spring Training that he had no plans to talk about his future in the game and has, to this point, held to that stance (link via the St. Louis Post-Dispatch’s Rick Hummel). But given that the 2018 season is the final year on Wainwright’s contract, there’ll be plenty of speculation as to whether the next few weeks with the Cards represent his big league swan song. Any such determination surely won’t come until after the season, though, and it stands to reason that the manner in which he performs and his ability to recover after this month’s starts will prove instructive in making that call. Wainwright is earning $19.5MM this season in the final year of a five-year, $95MM extension he signed prior to the 2014 campaign. As for Wacha, he hasn’t taken the mound since mid-June due to what seems to be a severe oblique injury. It should be noted that today’s news doesn’t technically mean his season is over. Wacha had already been on the disabled list for 60 days, so he’d already have filled that minimum requirement should the Cards deem him ready to pitch between now and season’s end. There’s been no indication that’s likely, however; to the contrary, Wacha was actually scratched from a rehab start last week due to renewed discomfort in his ailing oblique muscle. The 27-year-old enjoyed a fair bit of success when healthy this season, pitching to a 3.20 ERA with 7.6 K/9 against 3.8 BB/9 in 84 1/3 innings over the life of 15 starts.